Expectations for MOOCs have been shaped by offsetting waves of enthusiasm and skepticism over the past couple of years. At some point during 2014, however, the market began to arrive at a more balanced understanding of MOOCs as a way to efficiently deliver online courses to a wide field of students. In an earlier post, we presented a more nuanced view of MOOCs as a means of delivering timely and regularly updated course content to a wide field of students, as a platform that universities, corporations, or other organisations can adopt to deliver their own online courses, as a way to enhance education brands, and even as an emerging recruitment channel. Some say that 2014 was the year that MOOCs came of age in terms of profile and respectability, but also by virtue of a critical mass of investment, staff, and revenue. Class Central is a website that aggregates MOOC course listings from providers around the world. For prospective students, it offers a handy, centralised service to help students find available courses and providers. For educators and other stakeholders, Class Central offers a valuable perspective on the overall volume and scope of MOOC activity around the world. In its recent review of key stats and trends, Class Central offers a convenient summary of the rapid expansion of MOOC programming over the past three years and a detailed breakdown of the MOOC market in 2014. In the fall of 2011, Stanford University offered three online courses that drew a great deal of media coverage and even more students (as many as 160,000 in one case) and that led in turn to the establishment of Udacity and Coursera, the first commercial MOOC providers in the US. Looking ahead through mid-2015, the Class Central tally reflects the massive growth in course offerings since November 2011. 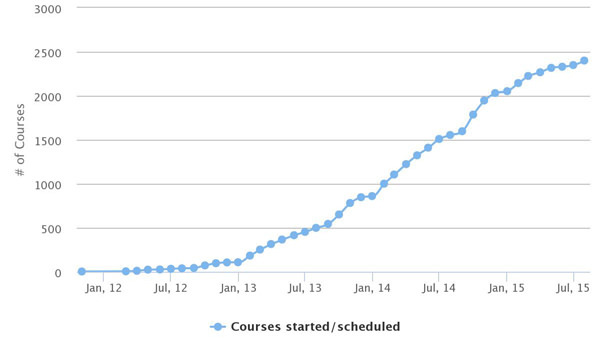 As the following chart illustrates, the cumulative number of courses started or scheduled reached 2,031 in December 2014 and will exceed 2,400 by August 2015. The number of universities offering MOOCs doubled to 400 institutions in 2014, and Class Central points out that 22 of the top 25 US universities (according to the US News & World Report rankings) now offer online courses for free. The subject breakdown for MOOC courses has been fairly consistent over the last couple of years. The Humanities, Computing Science, and Business Administration are the leading subjects, accounting for roughly half of all courses in 2013 and 2014. Courses are currently offered in 13 languages, the vast majority in English (80%), followed by Spanish (8.5%), French (4%), and Chinese (3.5%). The first MOOC platforms emerged from those initial Stanford courses in 2011 and they remain among the top five providers today. Coursera, as the following table reflects, claims the largest enrolment by a considerable margin followed by US competitors edX and Udacity. MiriadaX, a Spanish platform, is the first non-English platform to pass the one million student threshold and UK-based FutureLearn is poised to become the next service to enroll one million students. In terms of the distribution of course offerings, Coursera is again the market leader with 36% of cumulative courses scheduled or started to date (down from its roughly 50% share in 2013). 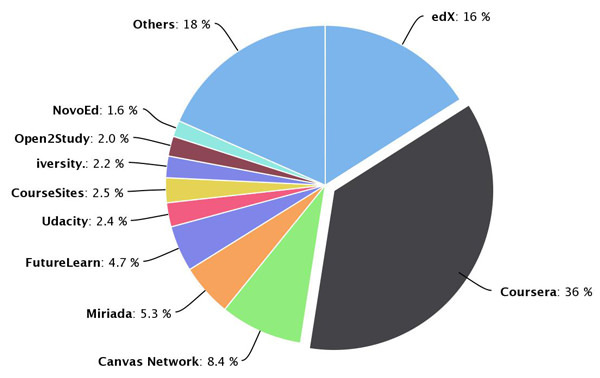 edX nearly doubled its course offerings in 2014 and now accounts for 16% of MOOCs worldwide. Class Central notes a number of important trends in the MOOC space in 2014, including the following. 1. The rise of credentials. Rather than emphasising courses for academic credit to any great extent, each of the three leading MOOC platforms – Coursera, edX, and Udacity – introduced their own credentials for paid courses over 2013 and 2014. These credential programmes give students the opportunity to earn a certificate for their MOOC studies, and they have emerged as an important part of the MOOC revenue model. 2. Investment in production quality. MOOCs continue to be criticised in some quarters for low production values but there were noted investments in improving quality and user experience in 2014. 3. edX becomes the world’s open platform of choice. edX offers an open source instance of its platform, Open edX, that institutions and organisations can deploy in order to release their own MOOC platforms. “Open edX quickly seems to become de facto platform for organisations and groups who are looking to host their own MOOCs… Currently there are 60+ instances of Open edX, running over 400 courses,” says Class Central. Furthermore, their recent partnership with Microsoft will help online course creators develop content with the PowerPoint add-on Office Mix. 4. The shift to “always on.” Many MOOCs continue to parallel traditional classroom offerings with set dates and schedules. However, 2014 saw a greater emphasis on self-paced courses and, as a result, on more granular, sharable course content. 2014 may have been something of a tipping point for MOOCs, in terms of more widespread adoption by institutions and other providers in the US and abroad and also with respect to a critical mass of investment and revenue base in the MOOC space. All things considered, we should expect MOOCs to play a larger role in supporting course delivery, building institutional brands, and leveraging the student recruitment effort in 2015 and beyond. This entry was posted in Africa, Asia, Australia/Oceania, Europe, Middle East, Most Popular, North America, Online Learning, Regions, South & Central America, Technology and tagged higher ed technology, universities with international students, distance learning, colleges with international students, community college.